The roadster is the sixth model to join the modern day Mini lineup, after the hardtop, cabriolet, the Clubman, the Countryman and the coupe. Mini has revealed the definitive production version of its 2012 roadster. Sister car to the recently introduced coupe, alongside which it will be built at Mini's Oxford plant in England, the compact two-seater arrives a little more than two years after it was first shown in lightly veiled concept car guise at the 2009 Frankfurt auto show. Rival to the enduring Mazda MX5, the Mini roadster is planned to make its public debut at the Detroit auto show in January prior to going on sale in Europe in early 2012. Pricing is yet to be announced, although it is expected to be several thousand euros more than the hardtop coupe model, which starts at 21,200 euros in Germany. 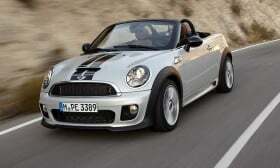 The current four-seater Mini Cooper cabriolet costs 23,550 euros, four thousand euros more than the hardtop version. At 3730mm (146.8 inches) in length, 1680mm (64.5 inches) in width and 1390mm (54.7 inches) in height, the roadster is just slightly smaller than Mini's existing open-top model, the second-generation cabriolet on sale in the United States since 2009. Unlike its four-seat open-top sibling, though, Mini's latest model is a strict two-seater, with the space behind the seats dedicated to extending luggage capacity, as in the coupe. In line with Mini's original design brief for the roadster, the multilayered structure can be lowered from the driver's seat, folding back behind the seats in a space ahead of a rear liftback. Mirroring the move taken with its new coupe, the roadster will be sold with Mini's familiar 1.6-liter four-cylinder direct-injection gasoline engine in three different states of tune. In naturally aspirated form it kicks out 121 hp in the Cooper, while twin-scroll turbocharged versions produce 181 hp in the Cooper S and 208 hp in the range-topping John Cooper Works models. Also available in Europe but not planned for sale in North America will be a 2.0 liter four-cylinder common-rail diesel engine with 141 hp in the Cooper SD. It is claimed to provide 0-100kph (62-mph) acceleration in 8.1 seconds, and a 211kph (131mph) top speed. As with the coupe, with which it not only shares its exterior and interior designs but also its complete mechanical package, the roadster will be available exclusively with front-wheel drive. Gearbox choices include a standard six-speed manual on all models. An optional six-speed automatic is also available on all models save for the John Cooper Works. Mini is talking up the dynamic properties of the roadster, suggesting that its lightweight fabric hood gives it a lower center of gravity than other models. The steel body structure adopts the same stiffening measures as the coupe, including a substantial brace at the rear that is said to boost overall rigidity to a level comparable to that of the hardtop. With a weight distribution biased toward the front, officials also claim the new open-top has better traction than earlier Mini models. A seventh Mini model -- in the form of a production version of the three-door Paceman concept car first revealed at the Detroit auto show in January 2011 -- is undergoing the final phase of development at parent company BMW's R&D center in Munich, Germany. It is planned to be introduced in 2012. Based on the Countryman, it will offer the choice of either front- or four-wheel drive and will be produced by Magna Steyr in Graz, Austria.